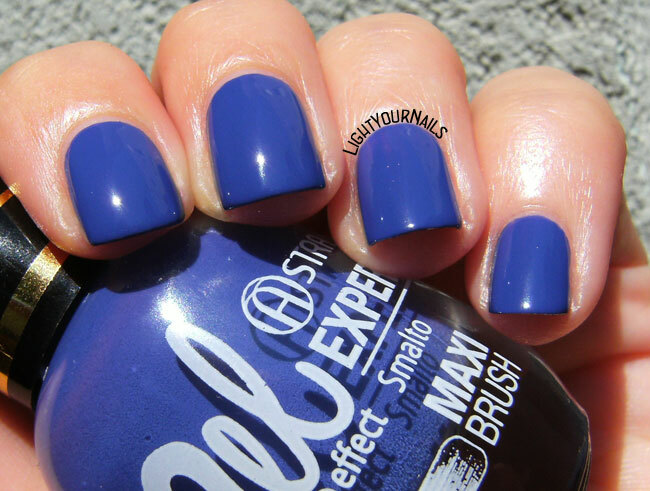 Astra Expert Gel Effect n. 36 Blueberry Beach | Light Your Nails! Anche oggi parliamo di un brand italiano, perchè diciamocelo, anche noi abbiamo dei marchi che non hanno niente da invidiare a quelli stranieri. Tra i brand made in Italy di fascia economica, ma di buona qualità, c'è sicuramente Astra. Di questa marca amo in particolar modo gli smalti della linea Expert Gel Effect, e nell'ultimo anno ve ne ho mostrati non pochi. Oggi in particolare vediamo lo smalto n. 36 di questa linea, Blueberry Beach, i bagliori mirtillo di una notte stellata. Lo smalto Astra Expert Gel Effect n. 36 Blueberry Beach* è una bella lacca blu che tende al viola. Come tutti gli smalti Expert Gel Effect si stende come il burro, è coprente in una sola passata, ed è già lucido come un gel anche senza applicare un top coat. Il colore poi lo trovo divino, quella via di mezzo tra blu e viola che tanto adoro. Non mi esprimo mai sulla durata degli smalti, perchè cambio colore troppo spesso, quindi per quanto mi riguarda i punti chiave sono il colore e la facilità di stesura, e qui li abbiamo entrambi. Un altro punto a favore degli smalti Astra è la formula 5free, ovvero non contengono formaldeide, canfora, resina di formaldeide, toluene e DBP, che sono igredienti nocivi. Today I’m talking again about an Italian brand, because we actually know how to do nail polish! Among the best cheap brands in Italy there’s Astra make-up. From this brand I really love the Expert Gel Effect nail polish line, and I’ve showed you plenty during the last year. I also like lots of their make-up products actually, but I won’t go in details right now! Let’s talk about n. 36 of the Expert Gel Effect line, Blueberry Beach. 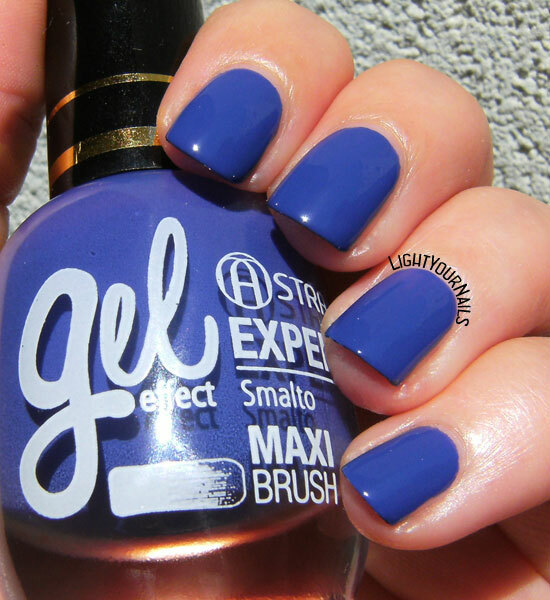 Astra Expert Gel Effect n. 36 Blueberry Beach* is a lovely blue leaning purple creme. As any other nail polish from the same collection it applies as butter, it’s opaque at first coat already and it dries incredibly glossy without a top coat. And what about the colour? I love blurples! I can’t speak about lasting time because I change my nails’ colour way too often for that so what I love in a nail polish is the colour and an easy to work formula. Good thing of Astra’s nail polish is they are 5free, i.e. they don’t contain harmful ingredients such as formaldehyde, formaldehyde resin, toluene, camphor and DBP. Let me tell you a 5free formula is pretty awesome for a less than 3€ price tag. Col n. 36 abbiamo finito di vedere tutti gli smalti che Astra ha proposto per la Primavera-Estate 2016, finendo col più scuro. Ora sono curiosa di vedere cosa uscirà per la brutta stagione, anche se continuo a sperare che arrivi il più tardi possibile! Vi lascio i link a tutte le altre colorazioni, in caso incrociate uno stand Astra mentre siete in vacanza e vogliate farvi tentare da qualche colore! No. 36 is the last colour that Astra released for Spring-Summer 2016. I showed you all of them, ending with the darkest shade. Now I am curious to see what they have in store for Fall-Winter, even though I still hope that happens much later than today. Here’s the links to all other shades just in case you are visiting Italy and stumble upon an Astra display! Don’t hesitate to pick up something if you do! Cosa ne pensate di questo smalto? Non è un colore perfetto per la fine dell'estate? What do you think of this nail polish? Isn’t it a perfect transition shade for Summer into Fall? E' davvero un peccato perchè fanno tanti prodotti buonissimi, specie per il prezzo che hanno! Haha I have no clue how they picked this name. oh my. Now stamp it! Ohh that is a really nice color and the formula sounds perfect!! Thank you Marisa! That formula is great indeed. This one definitely reminds me of a blueberry. I love this blue almost as much as I love yesterdays! Very pretty finish, looks great on you! Gorgeous creamy blue, long time ago I wore a shade like this. Need to again! It's been a long time for me, too! This is gorgeous! I'm so jealous! Ohhhhh yes! This shade is perfection! Per me questo blu ha un po' troppo viola per farmi pensare a nail art in tema nautico! è davvero uno smalto niente male. Io non li ho mai visti questi smalti ma dove si possono comprare? I must say that blue suits you so well! Love this one!